Maintaining dental health is an extremely important part of your pet’s overall health. Poor dental health can contribute to tooth decay, a painful mouth, bad breath, tooth abscesses, liver disease, kidney disease, heart disease, other organ dysfunction, and worsen any inflammatory condition (like allergies, inflammatory bowel disease, or arthritis). Inflammation is the root of all evil in the body, so pets and people live longer and healthier when good dental health is maintained and inflammation in the mouth is minimized. We all enjoy being close with our pets a little more when they have fresher breath! ​​We evaluate your pet’s teeth at each annual check-up or the twice a year check-up for those pets over 6 years of age. The need for dental care over the life of your dog or cat varies with each individual. Some breeds are more prone to dental disease and need more frequent cleanings – up to once or twice a year. Our major goal is to prevent damage and tooth loss over the years. Once we determine a need for dental care, we offer a wide array of dental services for your pet to deal with any problems and make a plan for prevention in the future. Most dog and cat owners have 2 major concerns about following through with regular dental cleanings for their pet – cost and anesthetic risk. We try to remind our clients that a routine cleaning before dental damage begins is considerably less expensive than waiting too long. The longer we wait to clean, the higher the likelihood of tooth extractions, additional procedures or permanent damage. Some of the damage that occurs will require more frequent cleanings for the life of your pet. It can also mean more care and maintenance at home or a trip to the dental specialist. Through our regular yearly offers of Dental Month, Cat Month, and two Young at Heart Months, there is an opportunity a few times a year to save some money on dental procedures. Keep track of notifications on our App, emails and social media postings to remind you when those times are each year. Anesthesia is never 100% risk-free, but risks can become minimal by performing a proper pre-anesthetic evaluation, careful selection of anesthetic drugs, and diligent monitoring by qualified individuals. Pre-anesthetic evaluation may include an exam, blood work, chest radiographs or an echocardiogram (heart ultrasound). A routine cleaning without further procedures also greatly shortens your pet’s time under anesthesia. Being well trained and attentive is the best way to avoid anesthetic complications. We take our role in this very seriously and make sure your pet is in good hands. We work as a team to make safety a priority. There are 3 people present when your dog or cat is getting a dental cleaning with us. 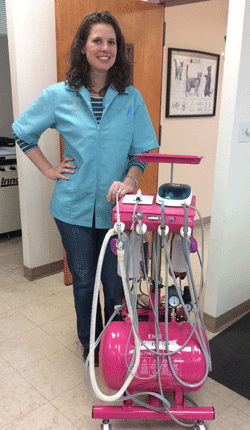 We have one technician responsible for performing the dental scaling and polishing. A second technician is dedicated to monitoring and managing anesthesia. Finally, our veterinarian is present the entire time overseeing the process and will be the one inducing anesthesia, performing a thorough oral exam and doing any procedures necessary. 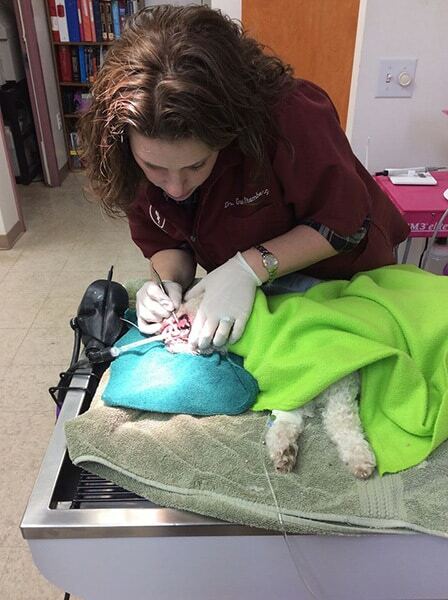 After the dental procedure is complete, one of the two technicians will monitor your pet continuously through the anesthetic recovery until they’re able to sit up without assistance. After that, the entire team regularly checks on all our patients until they go home with their owners. We are flexible with drop-off and pick-up times to accommodate your schedule and minimize the stress and anxiety for your pet. Feel free to ask us for a customized plan to accommodate your concerns. For additional information on minimizing stress for your pet during any drop off, please see our Drop-offs, Surgeries, and Worries page. Full oral exam and dental charting by the veterinarian. Some pets may ultimately need Specialized Dental Care. When we identify that your pet will need more advanced care, we will discuss the options and educate you on the process and the approximate costs involved. We will refer you to a Board Certified Veterinary Dentist in the area who provides the same great care for our patients. Clarksburg Animal Hospital is proud to provide animal dental care for pets and owners in Clarksburg, Germantown, Boyds, Damascus, Urbana, Ijamsville, Monrovia and the surrounding areas.